Happy National Robotics Week, fellow humans! One question we get asked a lot is, “What’s inside your robots?” The short answer is, “Lots of smart, techy stuff.” We realize that’s not very satisfying, so if you’re interested in the long answer, read on. When we released Sphero 2.0 nearly eight years ago, it blew people’s minds. A robotic ball that you could drive with your mobile device was an exciting combination of a traditional toy and cutting-edge tech. But the technology that powered the ball was obscured by an opaque shell. People started to ask us how it worked. “Is it magnets?” “How many hamsters are in there?” “Tell me the truth, is it possessed?” In fact, kids and teachers were so curious about the supposed black magic that made Sphero 2.0 move, they started sawing them open. Literally, sawing into our robots like amateur surgeons. This gave us an idea. Introducing Spearo 2.0, the surgical knife specially designed for dissecting robots. Just kidding. Maybe. We retreated to our dank, dark engineering cave and re-emerged months later with our very first transparent, programmable robot, SPRK Edition. Now the guts of our bots were out in the open for all the world to see. And it changed everything. We later released SPRK+ and the Sphero Edu app and started helping kids become fluent in coding, the language of the future. 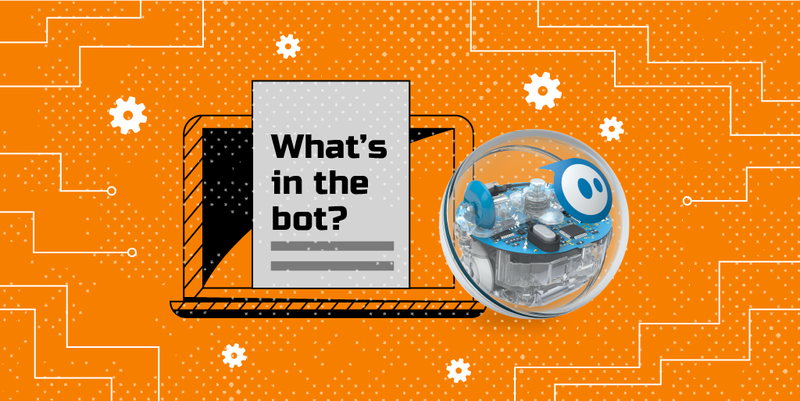 Since then, we’ve developed other programmable, education-focused robots like BOLT, and, most recently, RVR, with Ollie and Mini following suit in the Sphero Edu app. The LED, which stands for light emitting diode, is a component that emits light when a voltage is applied to it. The color of the light depends on the type of LED, and you can combine LEDs to make any color possible. There are also some invisible wavelengths that can be used to transfer information, such as infrared waves. Our sense of balance is determined in part by our vestibular system, or inner ear. The IMU, or inertial measurement unit, is sort of like the robot’s inner ear. This component is capable of measuring acceleration, as well as the amount of rotation that the robot is subject to. This information helps us stabilize the robot and provides a sense of direction. Encoders are a combination of two magnetic sensors and a spinning wheel made out of multiple magnets. The encoder wheel is connected to the motor, while the sensors are mounted in a fixed position. When the motor spins, the wheel creates a change in the magnetic field that can be measured by the two sensors. This is how we measure the speed of the robot. The PCB, or printed circuit board, is a compact combination of silicon and metal that holds and connects the small components required to make the robot work. PCBs are designed to fit snugly within the mechanics of the product. Think of the PCB as the nervous system of the robot. Batteries are chemical components that are able to create and absorb electricity in the form of a current by moving electrons from one terminal to the other. In this way, batteries are like the stomach of the robot — extracting the “nutrients” that help give the robot energy. The processors are components that the robot uses to gather data, make decisions, and execute actions. The processor executes the code that is programmed during the robot’s development and then stored in its memory. Processors are like the brain of the robot. The motors are electro-mechanical parts that convert electricity to motion. We typically use DC motors in our robots which are then powered by the onboard batteries. Think of the motors as the muscles of the robot. So, there you go. That’s a tiny taste of the tech that lives in our robots. 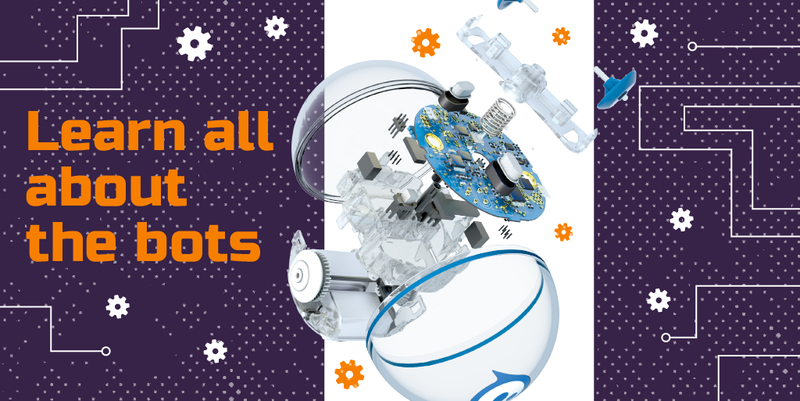 If you’re interested in learning more, be on the lookout for Sphero Live, where host and Sphero co-founder Adam Wilson, will be exploring these components (and others) in detail, speaking with engineers, and showing off his random robot collection. And make sure to snag some RoboWeek deals. SPRK+ Power Packs are $300 off. OR get a SPRK+ robot with a Turbo Cover for 10% off. Enjoy the week, humans and robots!